Have you dreamed of a modern lighting system, with the right circuits to control conventional, LED and moving lights, but thought it was out of your reach? If your venues lighting is 20, 15, 10, or even five years old, it time to consider upgrading to a 2014 Theater lighting control system. A 2014 Theater is a space of beautiful color, powerful control and maximum energy savings. It is a theater where every circuit can control tungsten, LED and moving-light technology. 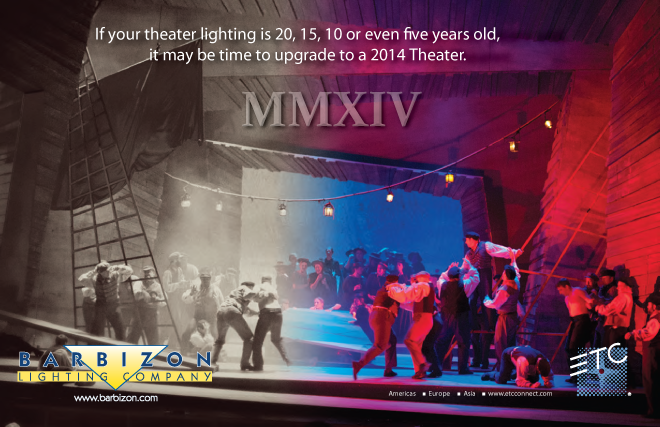 Best of all a 2014 Theater can be yours through a cost-conscious and stress-free upgrade of your existing ETC lighting system. This new program that ETC is calling – The "2014 Theater" – makes your dream a reality. This program lets you, with the help of Barbizon upgrade your existing ETC products without requiring a retrofit of your entire system, giving you the stress-free and budget-friendly system you want. This program is not only for Theaters though. It also applies to TV Studios and themed environments. As a part of program a member of Barbizon's team will come out to your venue and assess your current system and determine what modernizations would best fit your needs and budget. As part of the project, Barbizon can clean your Sensor® dimmer rack, add new modules to handle various loads, recommission it to factory specifications, and provide you with a new warranty. The 2014 Theater program also gives you the opportunity to incorporate LEDs into your designs, taking advantage of the energy savings, brilliant color and brightness that only ETC LEDs provide. And you can upgrade your control system to the Eos®-family desk that is perfect for you. After purchasing a package, a Barbizon project manager will work around your production schedule to install the new equipment, with minimal downtime and when it’s the most convenient for you. And Barbizon and ETC’s acclaimed 24/7 customer service will always be there to back up your new system. If you are interested in upgrading your venue or studio, contact your local Barbizon office or fill out this product selection form or email Barbizon's Director of Systems Bill Price at bprice@barbizon.com.